Sandy Key’s beaches are forever protected by the neighboring National Seashore Preserve. If you prefer your walks on the beach, solely in the company of the sea gulls, Blue Herons and sea shells, then Sandy Key is the place for you. 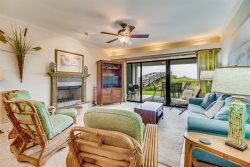 Sandy Key is located on 800 feet of Beach Front. This unit has 1219 SF of living area and a 200 SF beach front balcony. Ceramic Tile throughout Living, Dining, Foyer, Kitchen and Baths. Bedrooms are carpeted. Electronics include 42” LED TV, DVD, Stereo in Living Room, 27" TV in Master Bedroom and 15" TV in Guest Bedroom. We have used Period Realty for several years now. Our family has started using them as well based on our recommendations. The condos are always clean. The staff is so responsive. One night, we locked ourselves out of the condo. We had three kids running crazy. The staff answered the after hours line and were there in less than 15 minutes to let us in. Best experiences ever! Not enough adjectives to describe how much we enjoyed our stay. Only "bad" part of trip was having to leave. Condo, building, location, and nearby area - all were very much to our liking and we eagerly look forward to returning here soon. Your team was very courteous and efficient. We had a great week in the condo. Good weather and pools and tennis courts. We experienced timely, effective communications all along the way,-- then nothing but pleasant, relaxed hospitality when we finally arrived (at 4:50, 10 minutes before they close the office) on Saturday for check-in. Pure pros! The condo was superb. Beautiful - just as represented - and excellent bed/bath prep for our visit. Cleaning crew is to be commended for attention to detail. throughout. The Perdido Realty team was great to work with. This was our first time using Airbnb and working with this team made the entire experience easier and more comfortable. We will definitely look to use Perdido Realty again when booking through Airbnb. The condo was absolutely wonderful. The pictures were an accurate representation of the property. The other reviews were spot on as well. We will definitely look to use Perdido Realty again when booking through Airbnb and would love to stay at Sandy Key 514 again. Our week in the condo converted my husband to the condo way of traveling. The perks of having a real home to stay at on vacation with him over completely. Eating breakfast and playing games on the balcony while watching the dolphins play right below was AMAZING! I cannot say enough about what a wonderful time we had and how perfect the canyon was for our family. We are looking forward to our next trip. We had a great experience with the rental and will definitely be back next year. I could not believe how clean the condo was! A wonderful surprise to check in and just feel like we had nothing to do but go straight to the beautiful beach. Speaking of which-Tony was very nice and helpful. The team was great. Weather was perfect, your team went over and above supporting BEGA. See you next year. Best unit we've stayed in so far. The unit had everything we needed, clean and comfy. This is a beautiful, well appointed condo! We had a fabulous time . Thank you so much! Beautiful condo! We will definitely be back next fall.